With summer in full swing, it’s easy to jump on your ride and enjoy the open road. Remember, heat can not only have a devastating impact on your enjoyment but your body too. Your motorcycle accessories protect your body from the physical danger of an accident. Your biker gear can also combat the more subtle hazards to your health. Many people think of extreme weather as intense rain, hail or even snow. In the heart of route 66, it’s easy to forget about the intense heat. Most southwest natives can handle the “cool” temperatures of 105 degrees, as the thermometer starts creeping up above 115 degrees, we know it’s time to take some precautions. With the added heat your engine puts off it can get pretty steamy during your ride. Utilizing textile mesh or ventilated motorcycle accessories adds some cooling as they help evaporation of sweat. Riding at highway speeds intensifies the effect of heat and increases the rate of evaporation of sweat. In extreme heat, the body loses fluids at a higher-than-normal rate, which accelerates dehydration. When that happens, the body produces less sweat, and in combination with physical exertion, hyperthermia or heat stroke can develop. If you ever find yourself riding, on a scorching day, feeling a little nauseous or woozy, pull over and drink some water. There are many motorcycle accessories that can help keep you cool on your bike this summer. 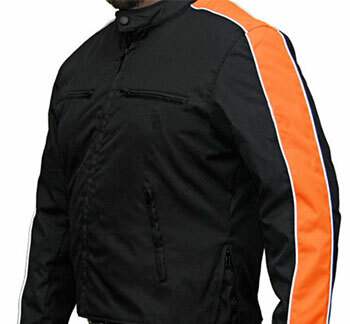 Motorcycle accessories, such as textile mesh jackets have a clear advantage over perforated leather jackets regarding lightness and air flow for cooling. Biker gear that includes leather in key areas in combination with textile mesh or solid textile with closable vents can offer the best of both worlds. You can wear full textile, non-mesh jackets that combine ready cool and damp weather capability with strategically-placed closable vents for good warm-weather performance. Perforated leather jackets and zip open vents can provide some welcome cooling. Unless there are several openings or extensive use of perforation, leather jacket tends not to breathe as well as a mesh or hybrid biker gear. Make sure to bring a lot of liquids if you are going to be air cooling the whole time though. For extreme conditions, a cooling vest can be a great motorcycle accessory. These have the advantage of working to cool body core temperatures which are key to helping prevent nasty heat effects. Full leather jackets that don’t use perforated leather can have effective cooling. By adding a zipper or hook-and-loop closure vent on the front of the body, shoulders, arms, and/or back of a leather jacket it can help reduce the heat stored in your body. Sweaty palms are unappealing to most people. On a hot day, it can be very tempting to go without riding gloves. Doing so can severely increase your risk of damaging and long term injury to your hands. Riding pants and chaps are great accessories for protection. While many bikers feel it is tough to beat good old denim jeans for all-around comfort with summer riding, the fact is, there are a lot of options out there that add value and protection. Even chaps can go a long way with protection from many types of weather. Sheepskins are godsend motorcycle accessories that help with comfort on the long rides. Sheepskin also aids in cooling; the fibers are naturally hollow allowing for greater breathability. The wool provides a comfortable cushion of air that acts as an insulator against all weather types, making it a high-quality item to add to your biker gear. The helmet can be one of the most uncomfortable parts of your motorcycle gear, but it is indispensable for safe riding. On very hot days a helmet is far from your best friend, but there are a lot of lightweight, well-ventilated alternatives available. Footwear with great ventilation for summer tends to be tougher to find. 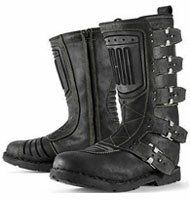 Cooling biker gear is available that offers protection for foot, ankle, shin, and Achilles tendon. There are many options out there, so take ventilation as well as comfort and protection into account when checking into riding footwear. Never count on being close to a store to buy something to hydrate yourself with in the event of a breakdown or unplanned stop. Make sure to bring water, juice or other things to drink, sunblock, a light long-sleeve cover shirt and hat for the times you get stuck out in the direct sun. If you or your passenger are allergic to bee stings or other things that you may encounter, be sure to take an Epi-pen or other medications as part of your motorcycle gear when taking long rides. Tire air pressures are always important, but when pavement temperatures are in triple digits, under-inflated tires become a disaster waiting to happen. Your tire’s time to failure gets even shorter if the bike is heavy with luggage and a passenger. Always check tire pressure before your trip begins. Electrical systems on modern bikes tend to be less affected by high heat environments than vintage bikes. It’s always a good idea to make sure connections are clean and tight whenever you do electrical work. Loose or corroded connections on the battery or in the wiring loom cause increased resistance and can build up heat. High temperatures can result in blown fuses or other failures. Carry extra fuses along in your kit and make sure you have the right amp rating and type of fuse for your bike. Enjoy your summer but ride safely. There are a lot of different motorcycle accessories to help your extreme heat ride go even better. Remember thunder-rode is your biker gear resource. We always offer a great variety of equipment at a great price.